The Crazy Cart from Razor is a relatively small cart with an electromotor attached at the front wheel and two "supermarket trolly wheels" as rear wheels, wich can be tilted by a lever. 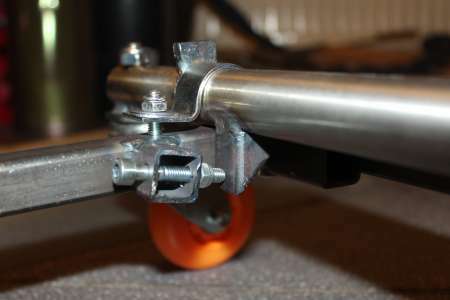 By pulling the lever, the wheels get tilted straight and allow the cart to drift without spinning wheels. 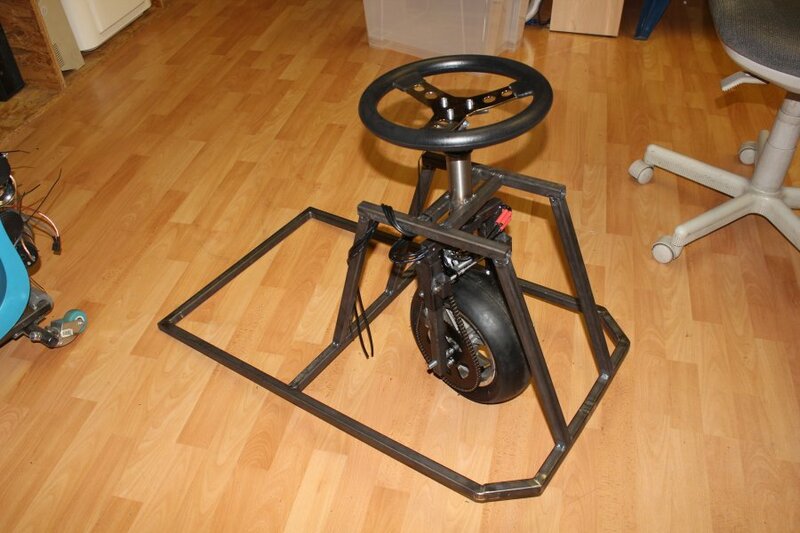 After I had the chance to try out a self-made Crazy Cart, it was clear: MUST HAVE! 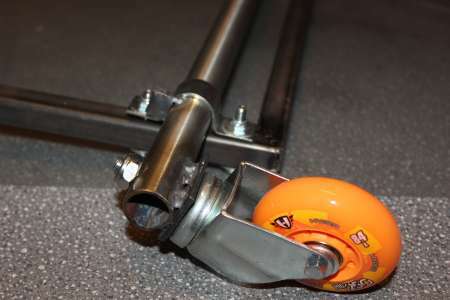 Besides the Crazy Cart there is the Crazy Cart XL for adults. 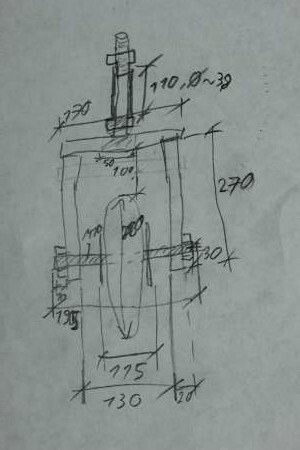 Luckily, in the owners manual one can find some exploded drawings wich may come in quite handy. 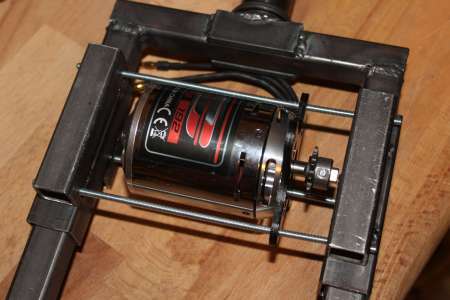 Instead of 300W (resp. 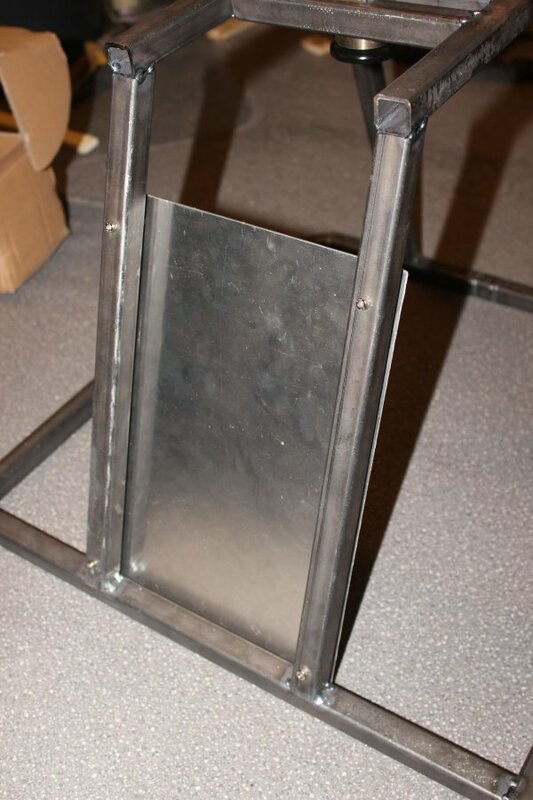 500W on the CC XL) it should be a bit more for the self-build version: 2.5kW is the target. 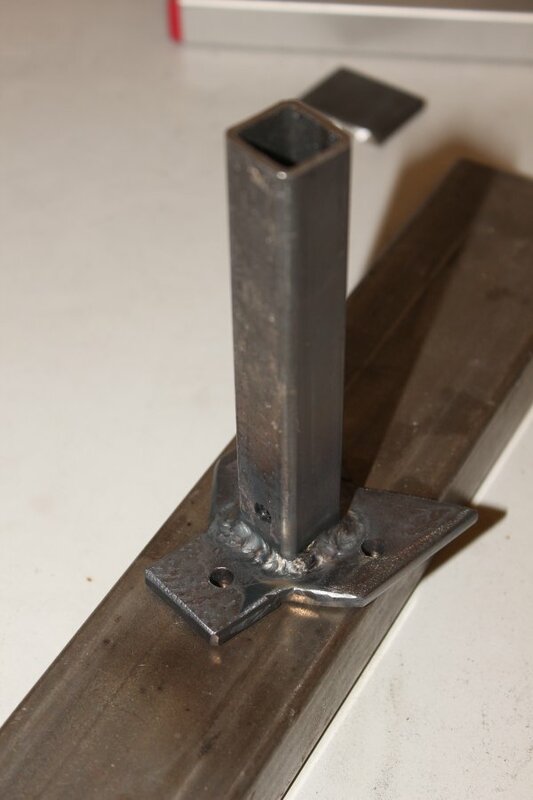 For that a stable construction is essential, 20x20x2mm steel sections will be welded together for the frame. The other parts can be bought mostly from various cartshops. Also a brushed motor isn't the right way to go, a brushless motor is much more efficient and less bulky. For driving the 3-phased brushless motor a brushlesscontroller is used (more info see below), wich gets it juice from a set of lipo batteries used in the rc-hobby. 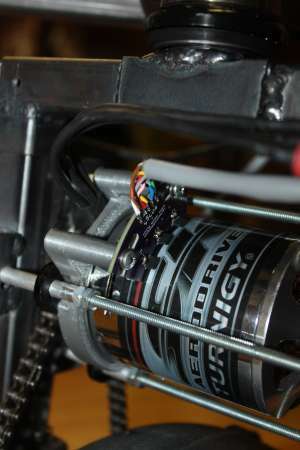 To get 2500 Watts, a 12S LiPo is needed with a current handling capability of 50A. Since a 12S Lipo is hard to get or is too expensive, three 4S 5Ah Lipos in series should be fine also. The whole project will be a build without instructions, so the build log will be in the order in wich I've done things. 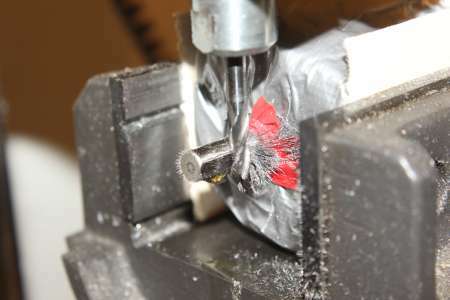 Changes in the building process are therefore likely. 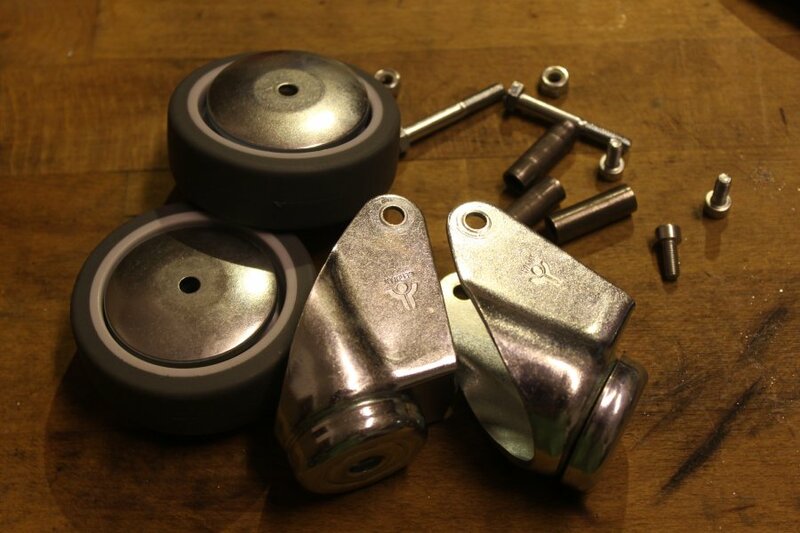 I stared by buying about 90% of the parts, because it could be helpful to test things out directly rather than measuring everything in detail. Also, because I had to order in so much different shops it could be possible, that one part isn't available later on. 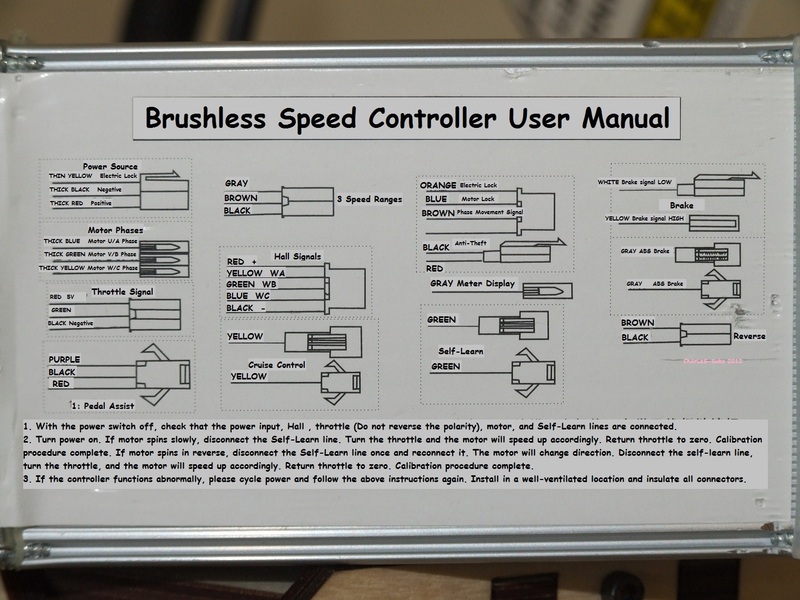 Anyways; let's start with the brushless controller I choosed, a so called Jasontroller. 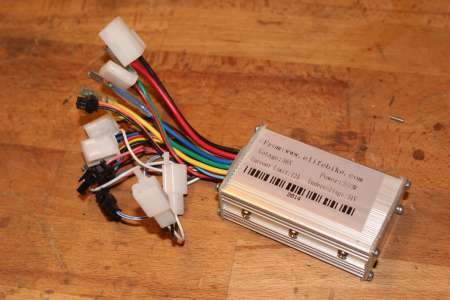 For about 25 euro shipped from Elifebike: E-Bike Motor Controller. 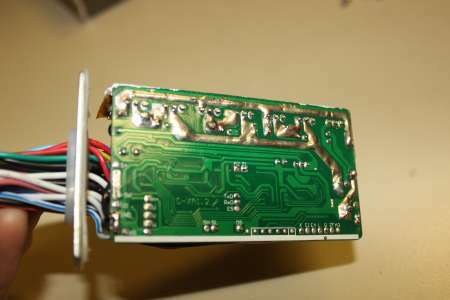 All the wires that come out of the controller aren't labeled, to to look up wich wire means what one can look it up in the wiring diagram. 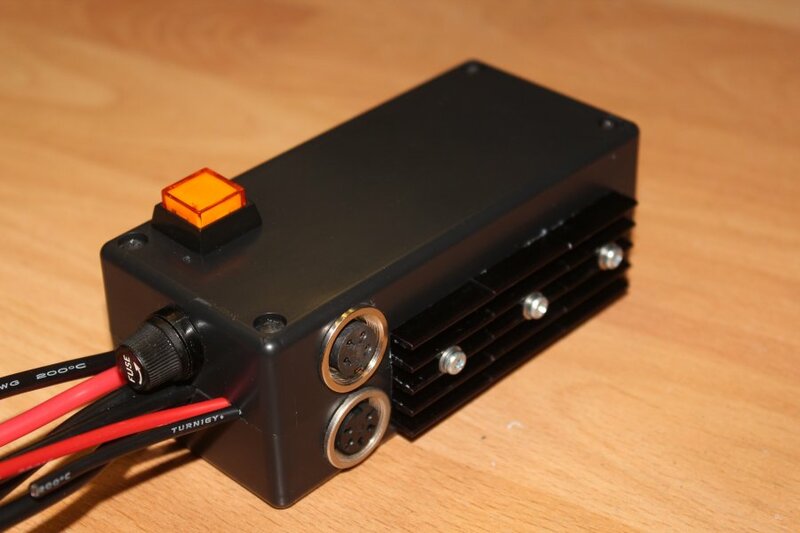 As one can see on ELifeBike, the "mini jasontroller" is rated at 36V/48V and 500W. 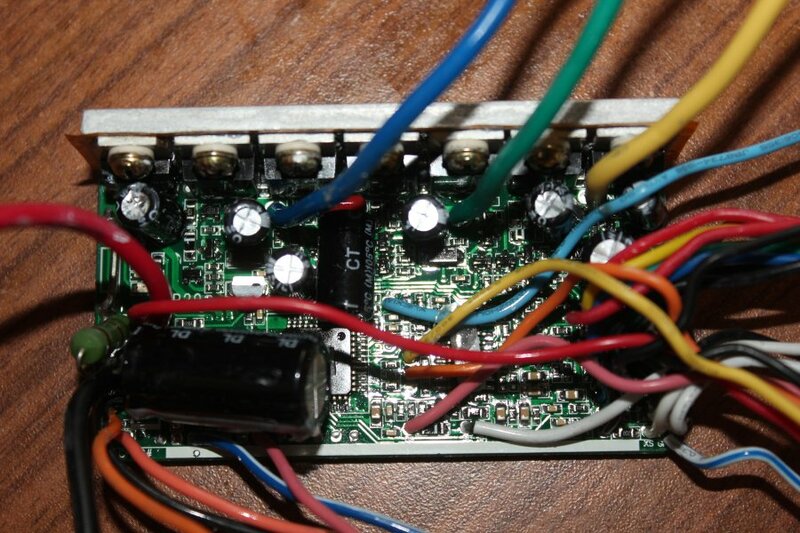 My unit is labeled with 350 Watts, wich doesn't matter because the only thing that is different is the shunt resistor. So to get a bit more power out of this thing you need to minimize the value of the shunt (the small resistive wire bridge at the edge of the pcb), so that the voltage drop will be less and the current limit will step in at a higher current. By measuring the voltage drop over the shunt at 1A current, I was able to calculate the stock shunt at 6 mOhms. By the use of the rule of three a 0,84 mOhm shunt is needed to get 2.5kW. By leaving the 6 mOhm and adding an 1 mOhm resistor in parallel you'll get ... 1/6mOhm + 1/1mOhm = 1/R ... R=0,857 mOhm ... about 0,86 mOhm, close enough. 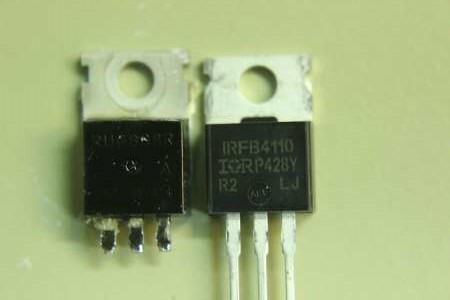 For the Mosfets (RU6888R, Datasheet) to not blow up themselfs and the rest of the controller, I changed these cheap mosfets for some IRFB4110 (Datasheet) from Reichelt. 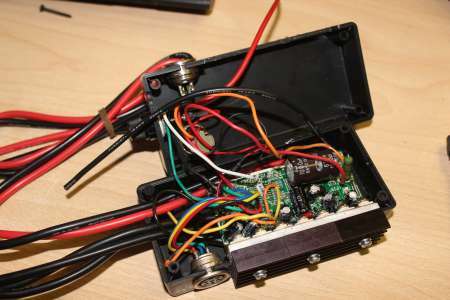 Later I am going to change some of the wires and solder in some bigger ones (10AWG - 12AWG Silicon wire), especcialy those coming from the batteries and those going to the motor. 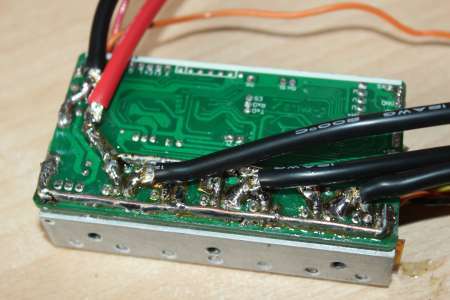 Also I will solder some copper wires directly to the pcb traces wich carry a lot of amps. 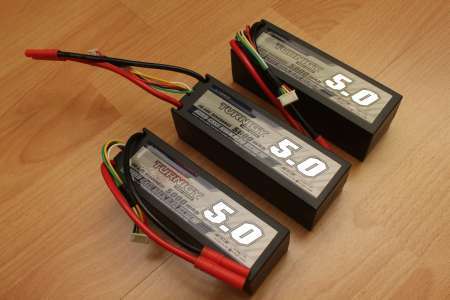 The batteries, that I'm going to use are three 4S 5Ah 20C Lipos from Hobbyking. Because I'm not dependent on the full 20C rating (20C * 5Ah = 100A), the cheapest ones are good enough: Turnigy 5000mAh 4S1P 14.8v 20C Hardcase Pack. 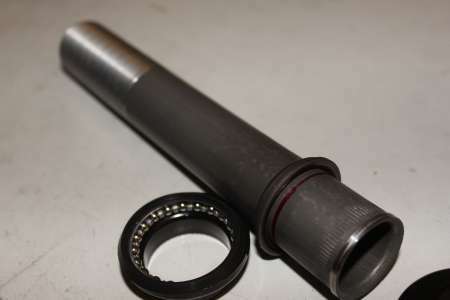 The 4mm bullet connectors will be replaced by XT60 connectors. 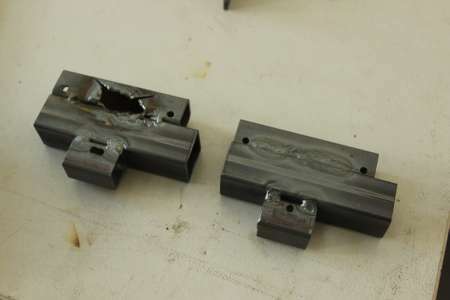 Luckily I am able to reuse one side of the the 4mm bullet connectors for the connection to the motor. 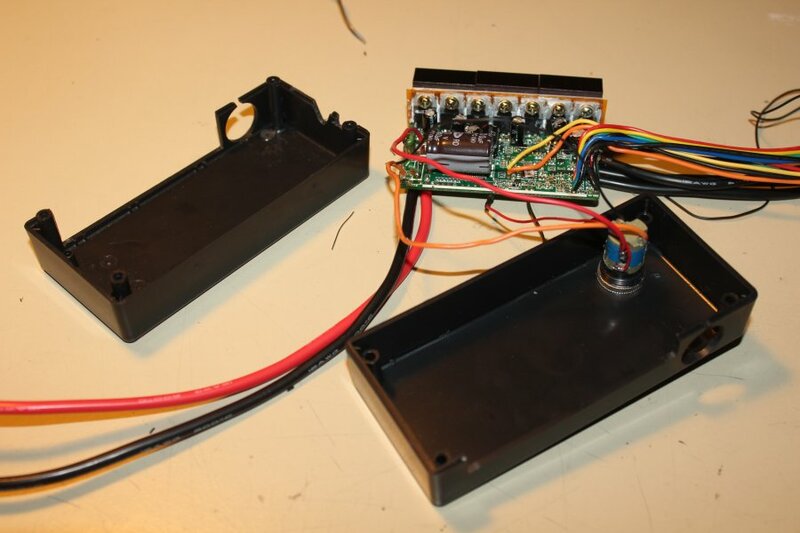 One Lipo had a cell droped to 3.2V when they arrived, the other cells were at 3.9V. 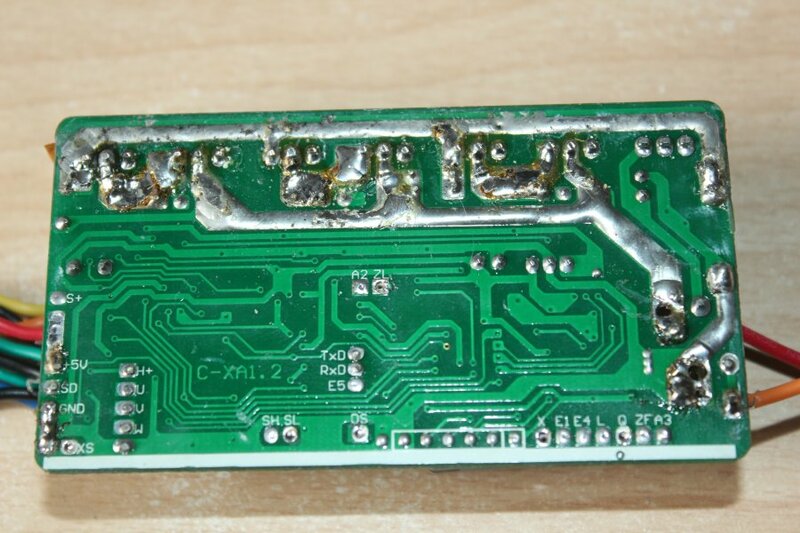 After charging only that one cell to 3.9V I couldn't notice any damage. 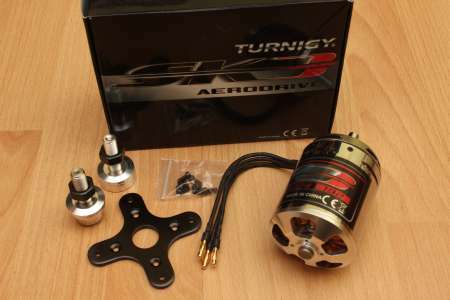 The motor is a Turnigy Aerodrive SK3 with 192KV and 2.75 kW maximum Power. 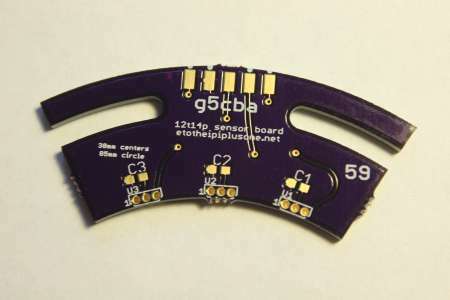 The outer diameter is 58mm, the presoldered connectors are 4mm bullet connectors. 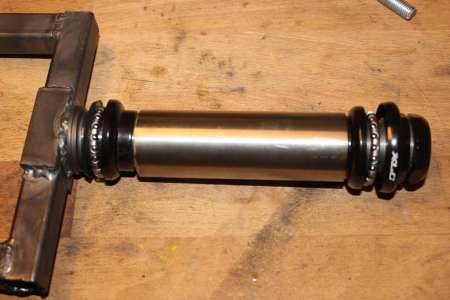 For the 11 teeth 25H cogwheel to fit on the 8mm shaft, I had to flatten it a few millimeter. 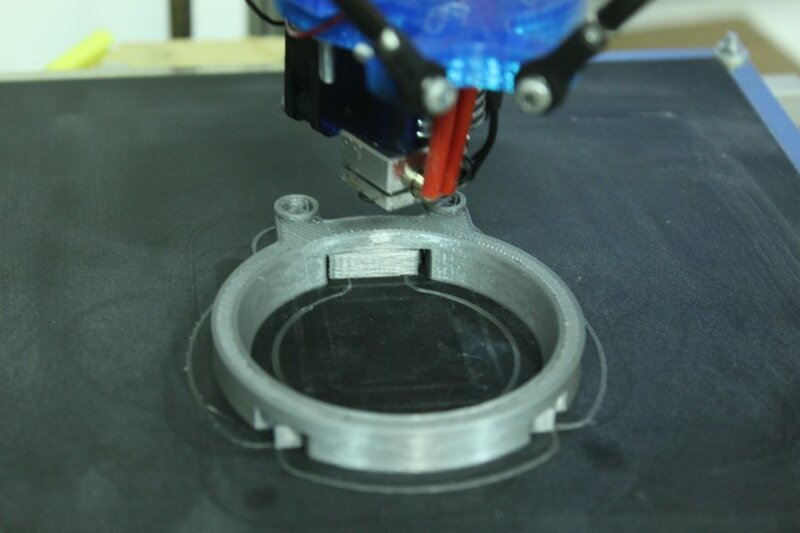 With lube and clamped in the CNC, I milled the material in 1/10mm steps until the cogwheel fit. 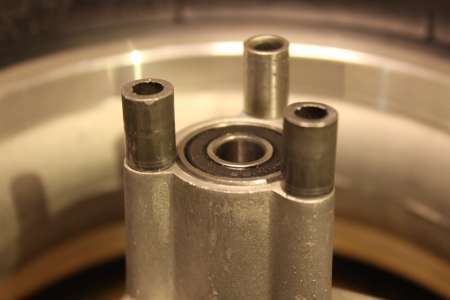 A 8mm adjusting ring keeps the cogwheel in place. 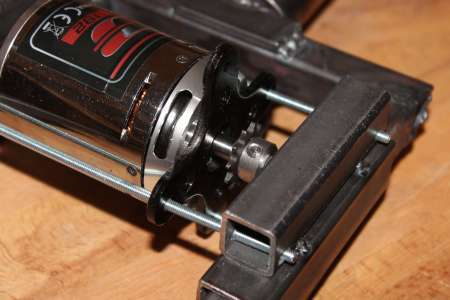 The Jasontroller has the wonderful feature to determine the position of the motor by hall sensors instead of turning the motor randomly until it can determine the position by its current flow. 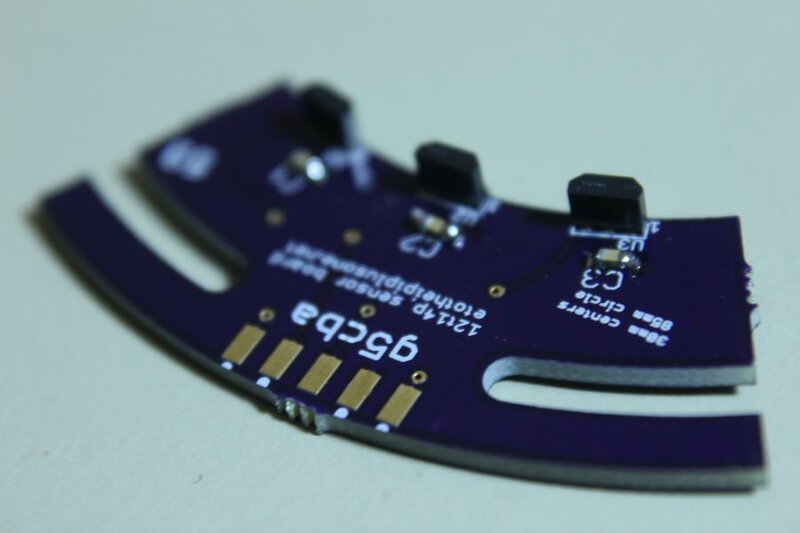 A ready to use pcb with hallsensors is available at e0designs.com. 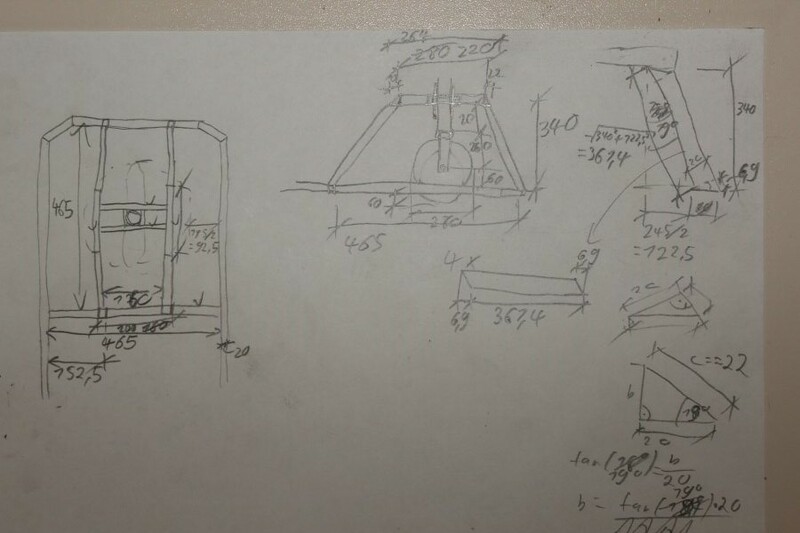 Also there are some building instructions available. 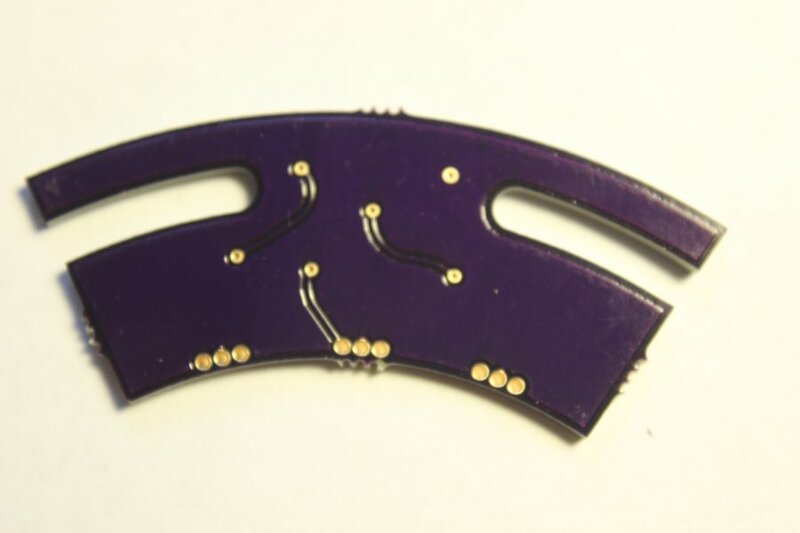 However, because the eagle files are available for free I got a pcb for cheap through an collective order at a pcb manufacturer. The ATS177 hallsensors (3 are needed) were only available at Digikey, as well as the SMD shunt resistors for the controller (see below). 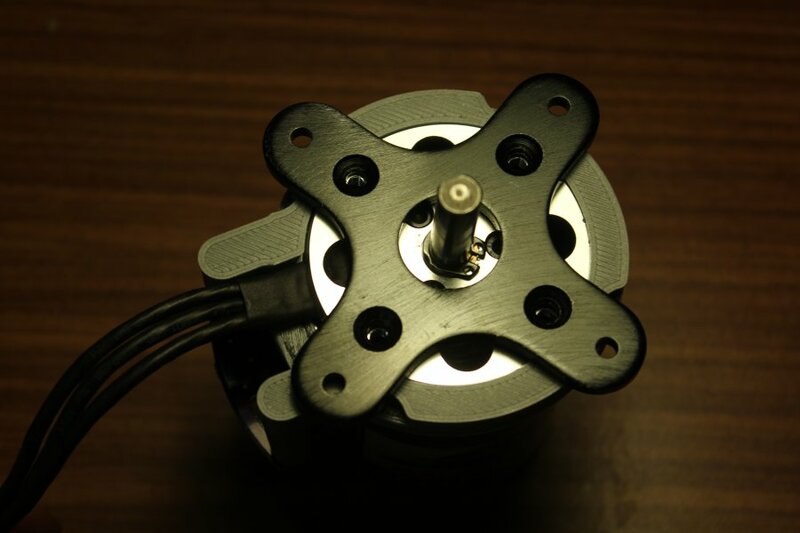 The 3d printed adapter to mount the sensorboard to the motor is also available as an STL file. This adapter is held to the motor on one side by the mounting cross that came with the motor. The pcb can be adjusted a few mm sideways. 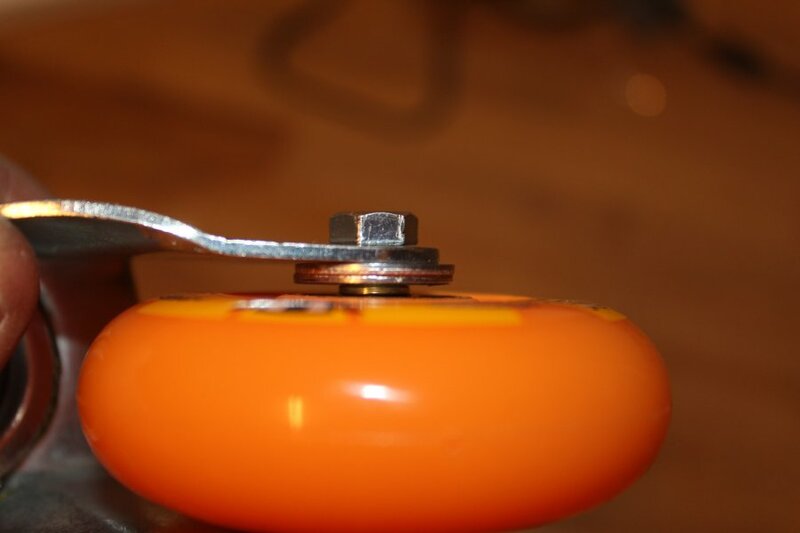 This will be important when I'm going to fine adjust the controller. 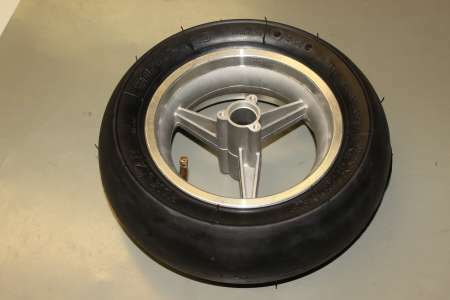 Next to the front wheel. 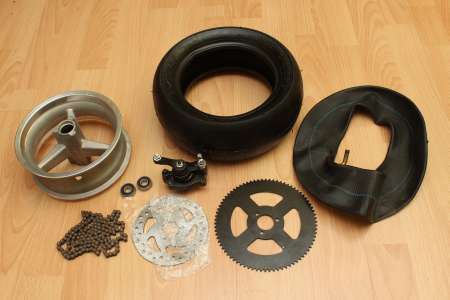 A short list of the parts displayed in the picture. 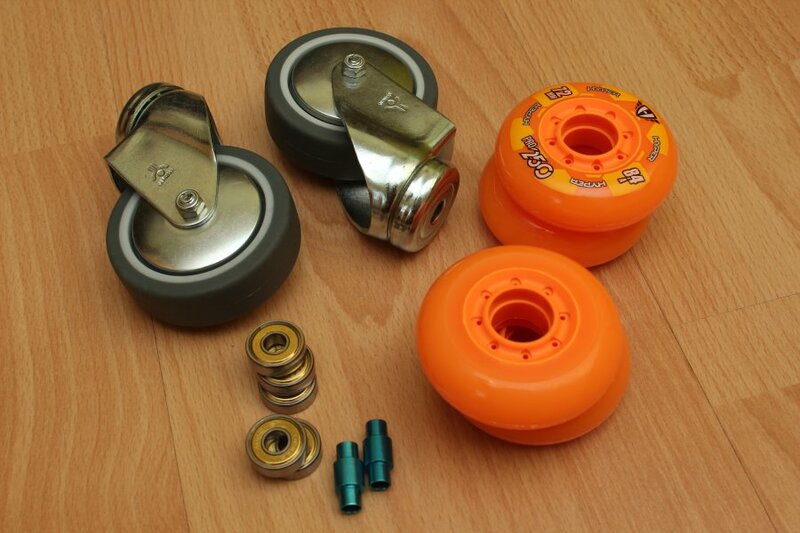 The linked shops are only example suppliers. Some of the parts are possibly available somewhere else for cheaper. 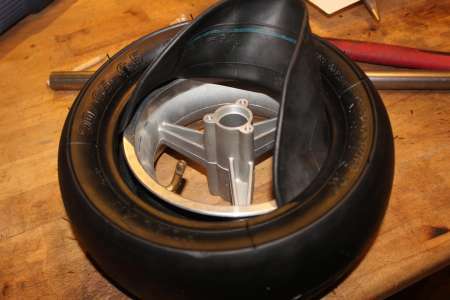 Getting the tube on the wheel rim wasn't easy, but worked out quite well at the end. Later I will get a cap for the valve, to seal it against dirt. 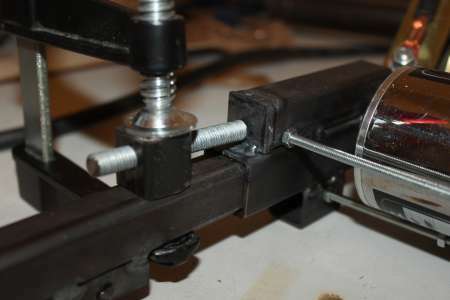 For the 26mm ballbearing (26mm outer, 10mm inner diameter) to fit in the rim, I needed to remove some material off the rim, after that the bearing went straight in by the use of a piece of wood and a hammer. 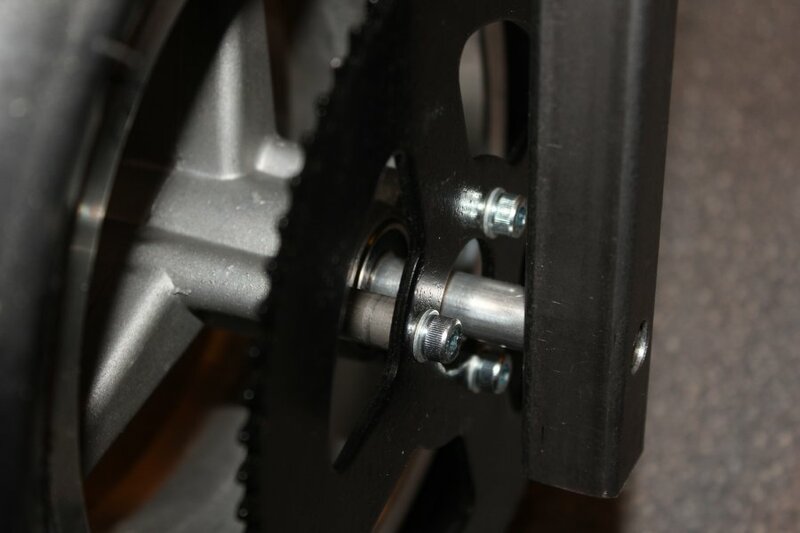 On the side where the chain wheel gets mounted I had to put three spacers in between, so that the chain does not scratch the wheel. 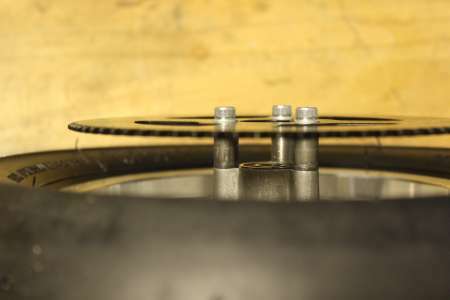 The brake disk get mounted on the other side of the rim where I had to drill and tap three M5 holes. 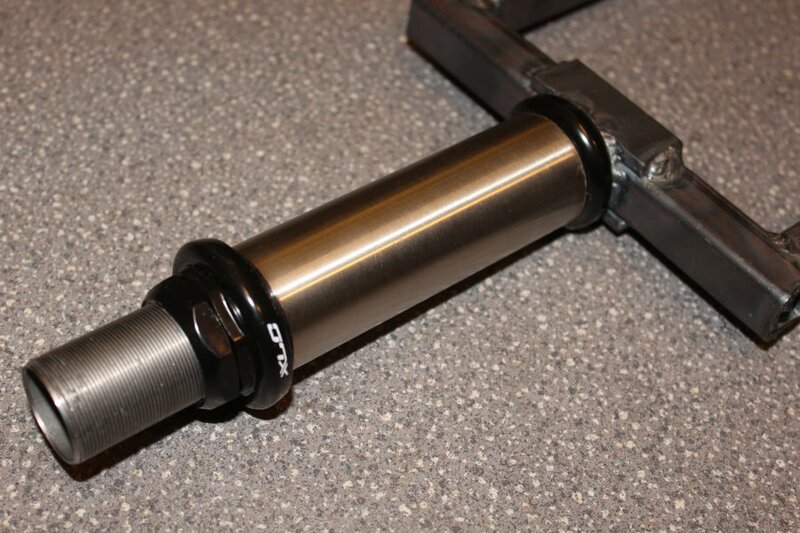 From the steering rollers I'm only going to use the frame and the upper bearing. 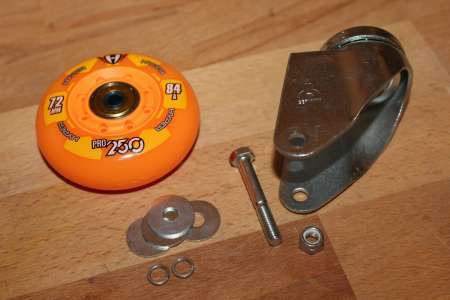 The 608 ball bearing as well as the spacers get pushed in the skate wheels. With some washers on both sides as spacer the wheels can be mounted into the steering roller frame. 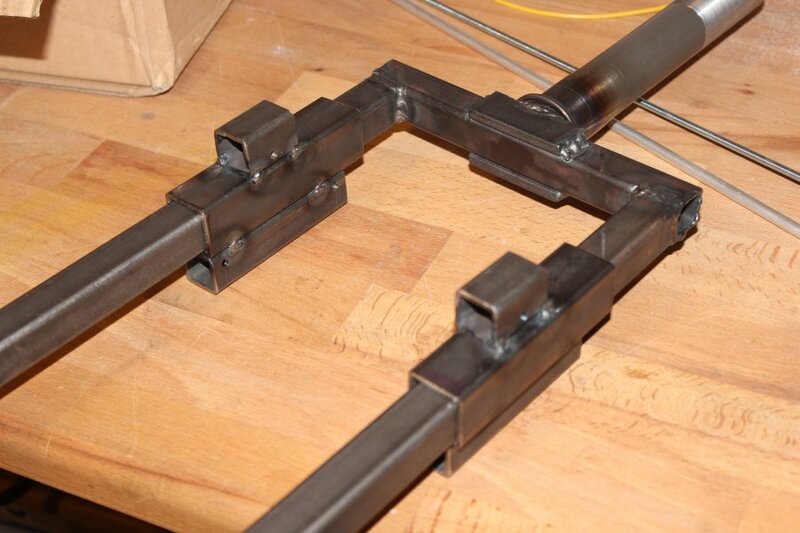 Moving on to the frame build out of 20x20x2mm steel sections. 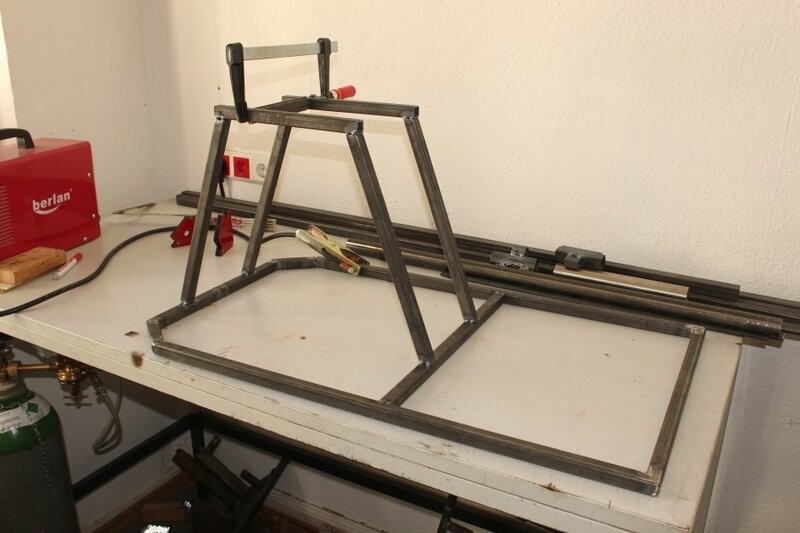 The outer dimensions of the frame are 500mm by 900mm. The wheel fork for the front wheel is 270+20mm height and on the inner side 130mm wide. 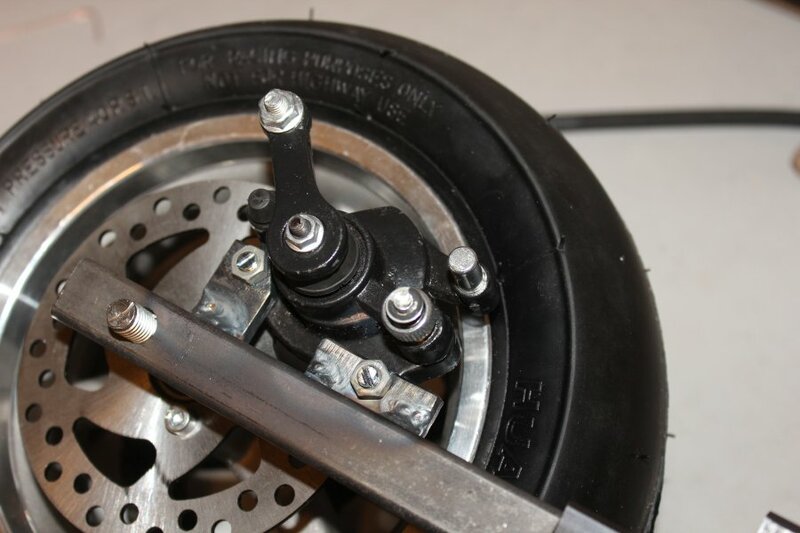 The front wheel gets mounted to a M10 threaded rod. 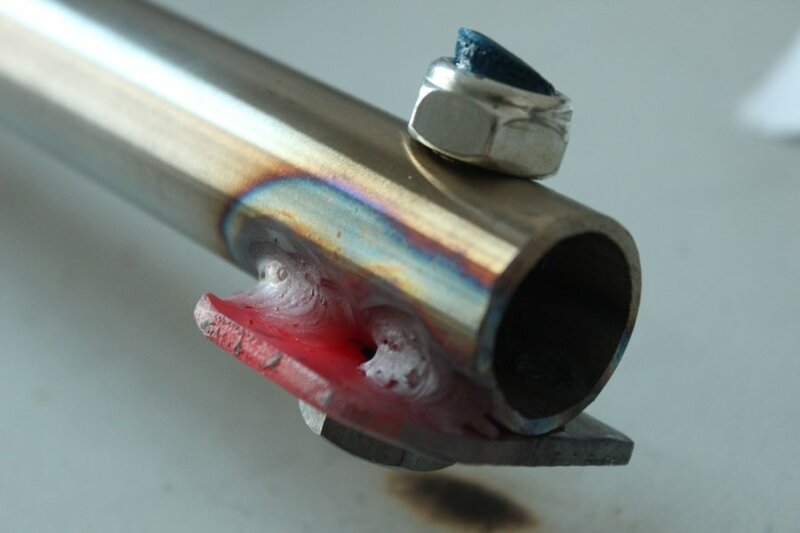 For the front wheel to be able to steer, a 1 1/8" steer tube gets welded onto the fork. 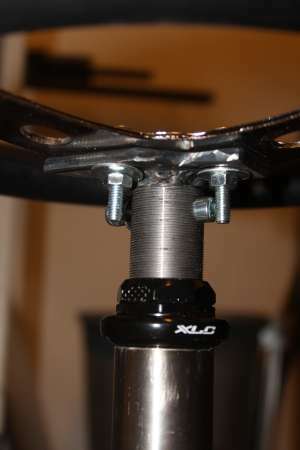 On the lower end a few 1/100mm needed to be turned to allow the lower ring of the headset to fit perfectly. 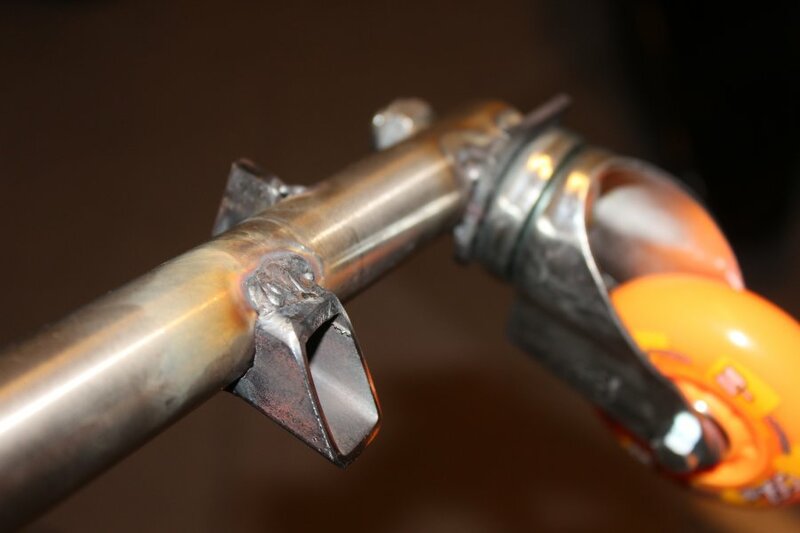 After that the steer tube was welded to the center of the wheel fork. Between the two parts of the headset a steel tube (about 11cm long) gets inserted and later welded to the cart frame. The space on the left and right side of the wheel on the threaded rod was filled by some aluminium tubes, so that the brake can be mounted to the brake disk as well as having enough space on the other side for the chain not touching the wheel fork. 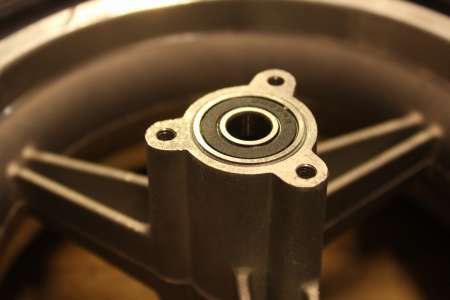 The motor gets mounted on top of the fron wheel between the sides of the fork, where it will drive the wheel directly through a chain. 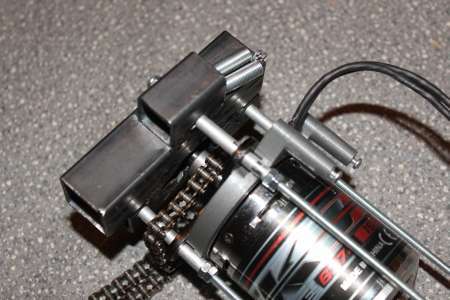 To be able to tense the chain, the motor has to be able to move a few cm up and down. 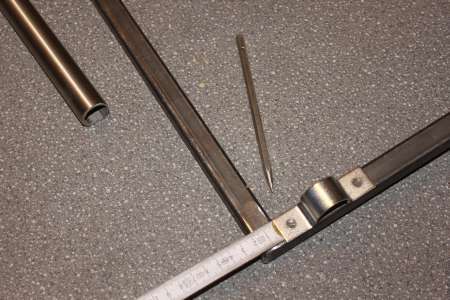 Two bigger steel sections get slided onto the fork, then the motor gets mounted on three M4 threaded rods by the use of the supplied mounting cross and secured by three aluminium tube pieces as spacers and some nuts. 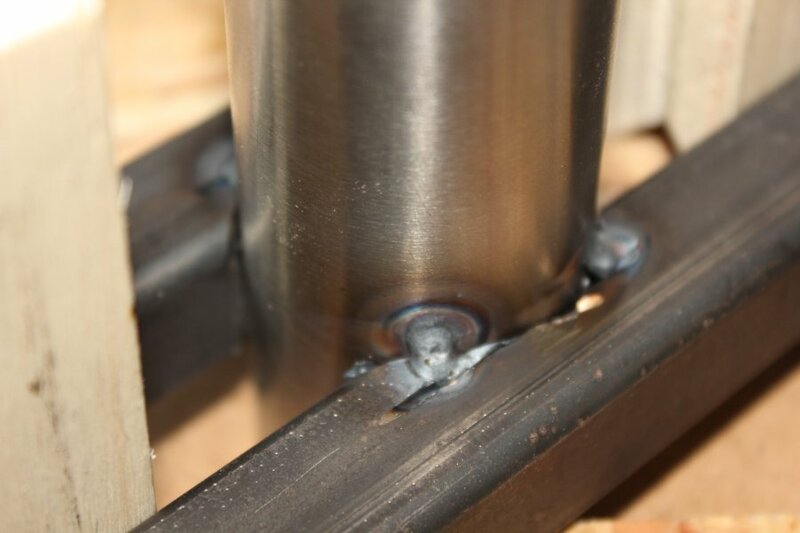 In on side of one of the mounting blocks I had to cut/weld a big hole, because the motor shaft was a bit too long. 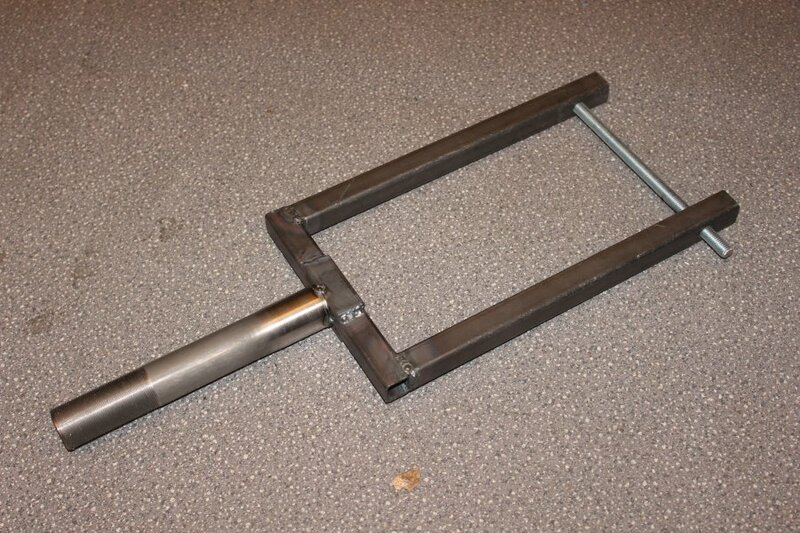 Maybe it would have been better to make the wheel fork one cm wider.. too late. Back to the frame and the wheel fork suspension bracket. 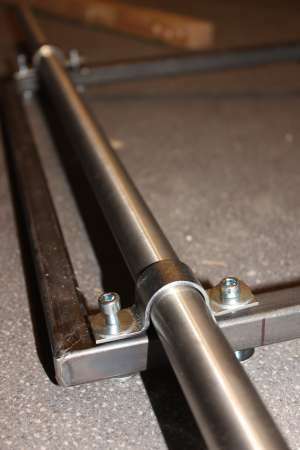 First a crossbar was attached to the frame, such that the front part has square dimensions and the front wheel has the same minimum distance to all sided when steering. 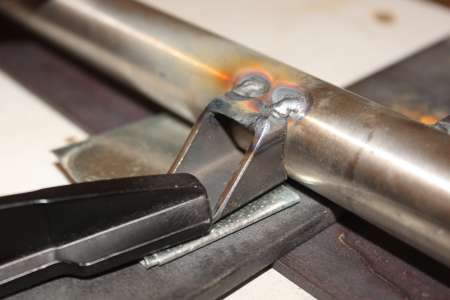 I started by welding two "arcs" with an inner distance to each other of 20cm to the frame. 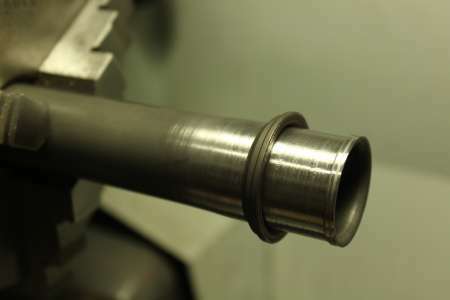 As mentioned before, I cut and turned a steel tube wich fits to the headset to 110mm, so that the ends are perfectly flat. To mount the steel tube to the frame I had to attach two steel sections with a more or less round outcut to the tube. A bubble level helped by aligning the tube to the frame and clamping it in place so I can weld it together. 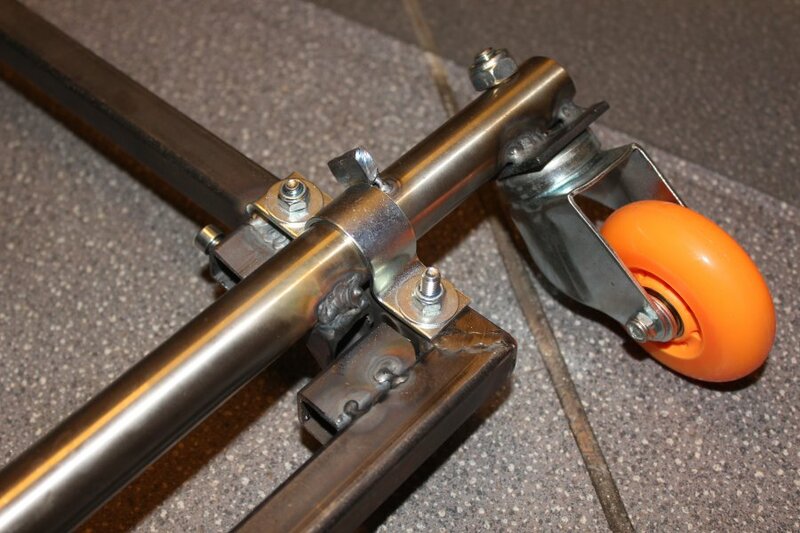 The CC has the advantage to drift and drive sideways. 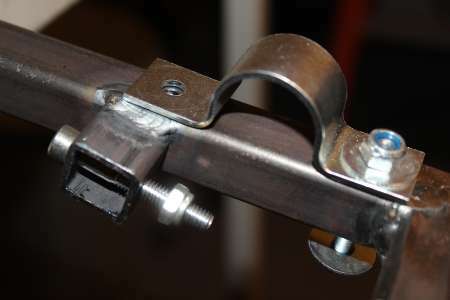 For that one needs to steel easily 90°, wich would be difficult with handlebars. 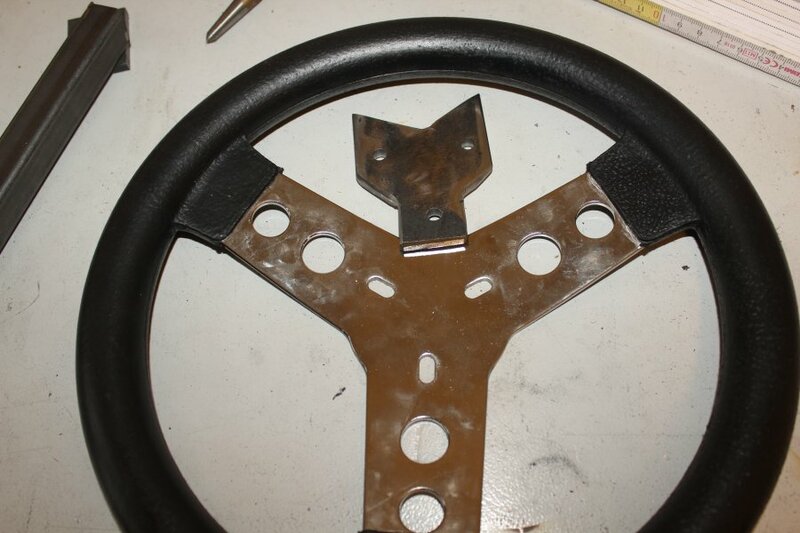 So I decided to buy a 280mm diameter steering wheel. 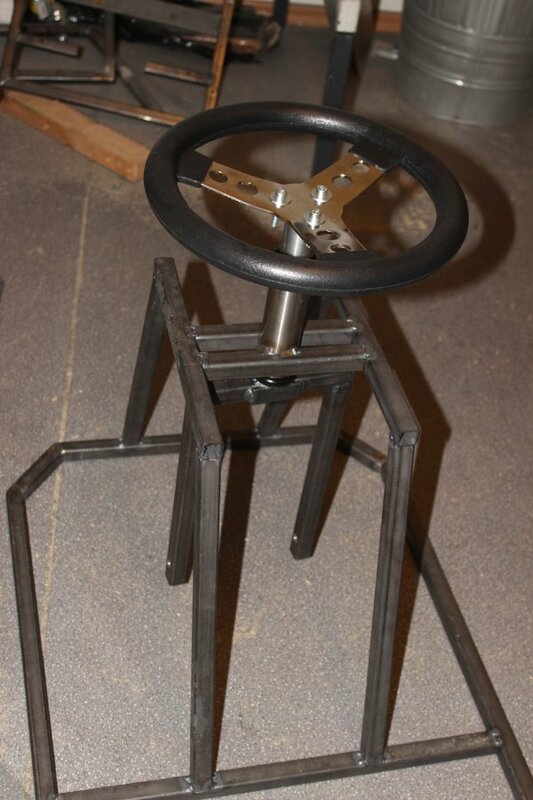 Next I needed to attach the steering wheel to the steer tube in some way, but it had to be also detachable so the headset for example can be removed later. 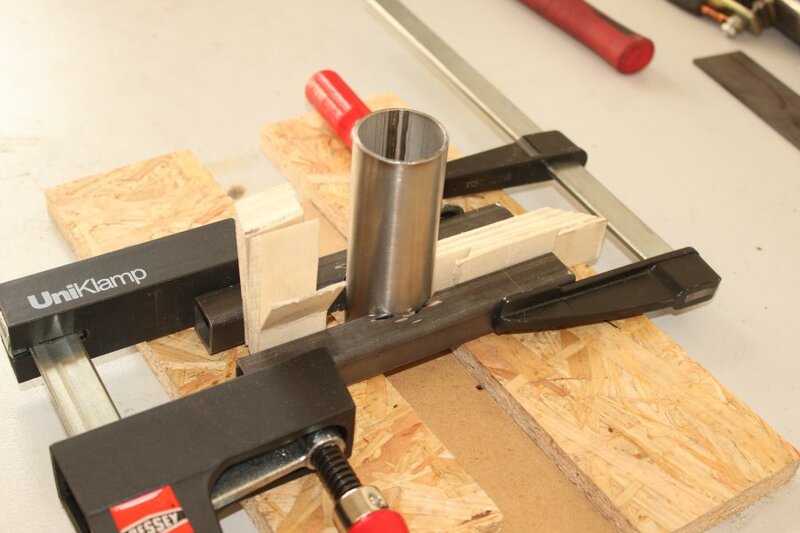 Fortunately a 20 by 20 steel section fits just fine into the tube. So I drilled a 6mm hole through both the tube and the square steel section. By inserting a M6 screw the steering wheel is secured against twisting. A steel plate with three holes to attach the steering wheel gets welded to the steel section. Of course the screws will be trimmed later. 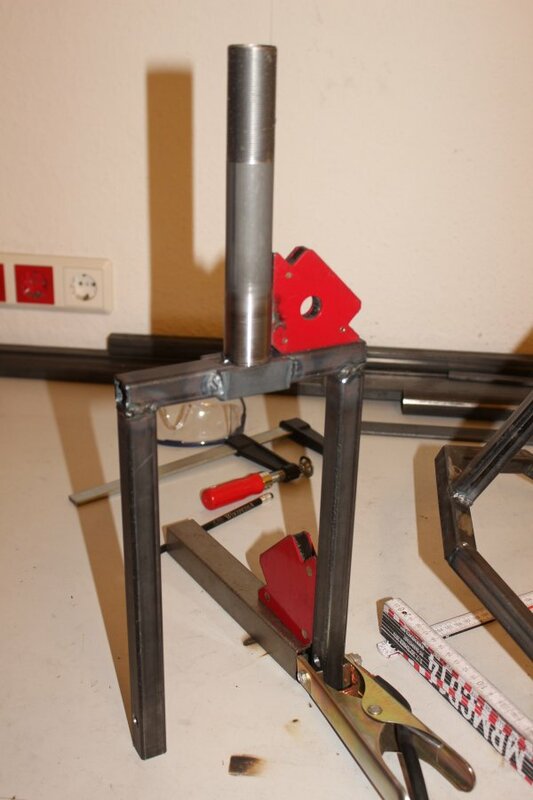 Thats all for the steering mechanism. Now it was time to attach the motor together and trimming the chain to the needed length. 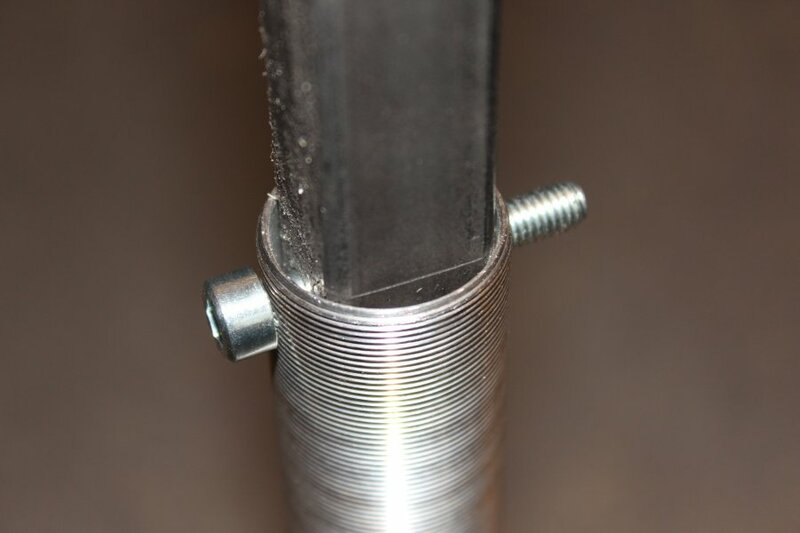 The bolts that are holding the chain links together can be pushed out by the use of the right tool. 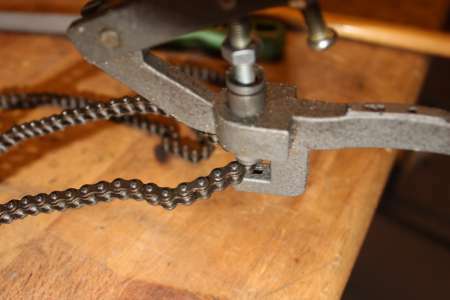 After that the chain joint is placed to put the chain back together. 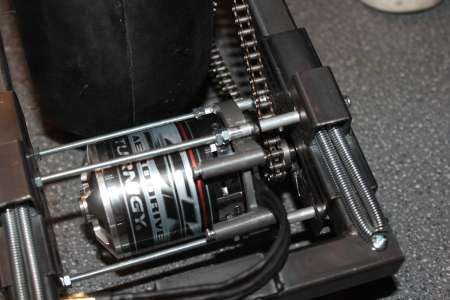 While mounting the motor I had to not foget to attach the chain to the gear, because it needs to go around one of the M4 rods wich are holding the motor. With the chain attached it now has to be tensioned. So I tried a dynamic type of tensioning and used on each side two springs to pull the motor assembly up. Sadly, the chain does slip on high torque so I will try to use some stiffer springs. 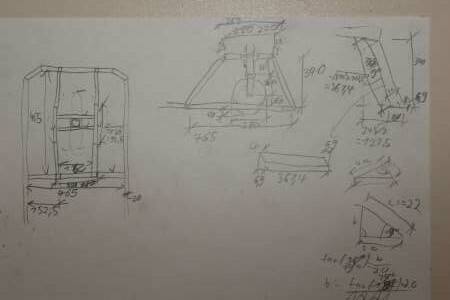 Followup: Eventually I decided to not tension the motor by just a spring. 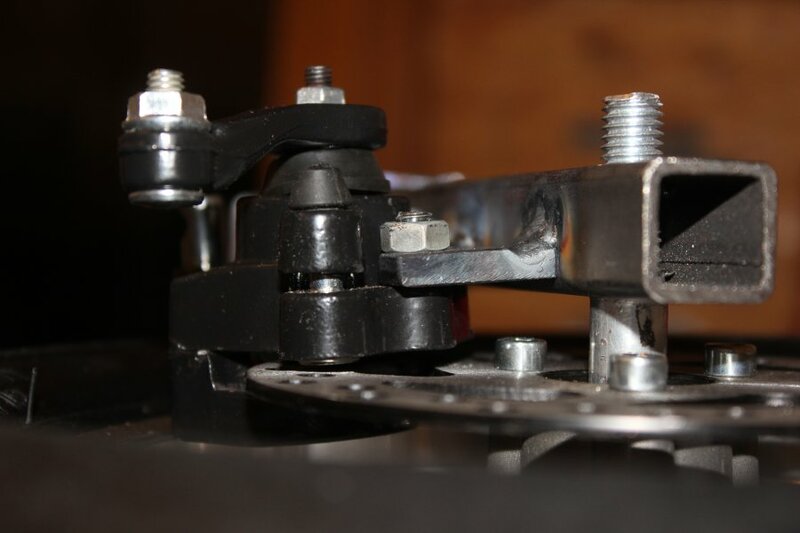 On both sides a screw pushes the motormount up, therefore the chain is now tensioned reasonably tight. 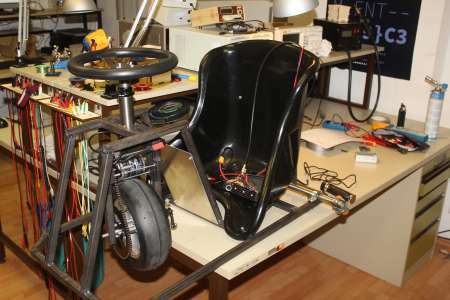 Because the cart will have a topspeed of 50km/h (~ 30mp/h) a brake is not a bad idea. 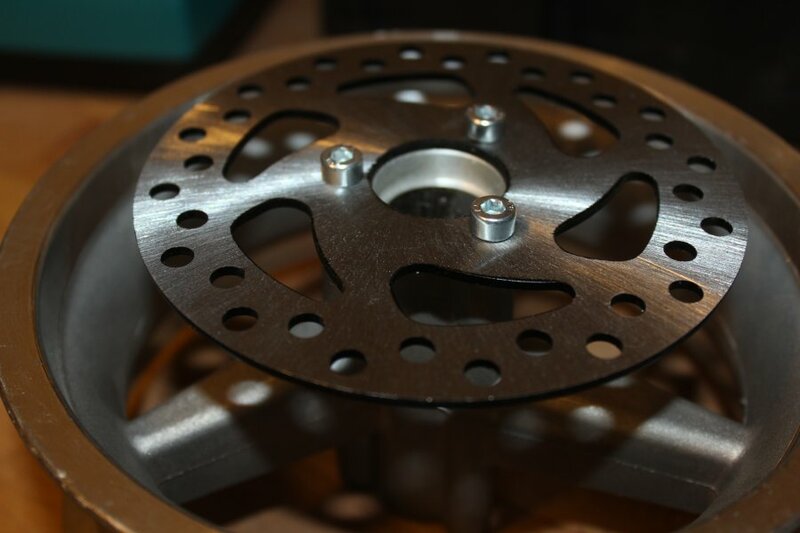 The disk for the disk brake is already mounted to the wheel rim. The brake itself has two holes with M6 threads for mounting where I attached two small pieces of steel. 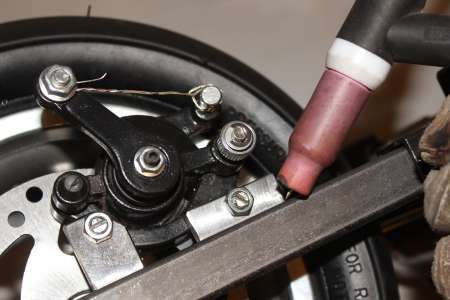 Then I placed the brake on the disk where and pulled the lever with a wire so it doesn't move. 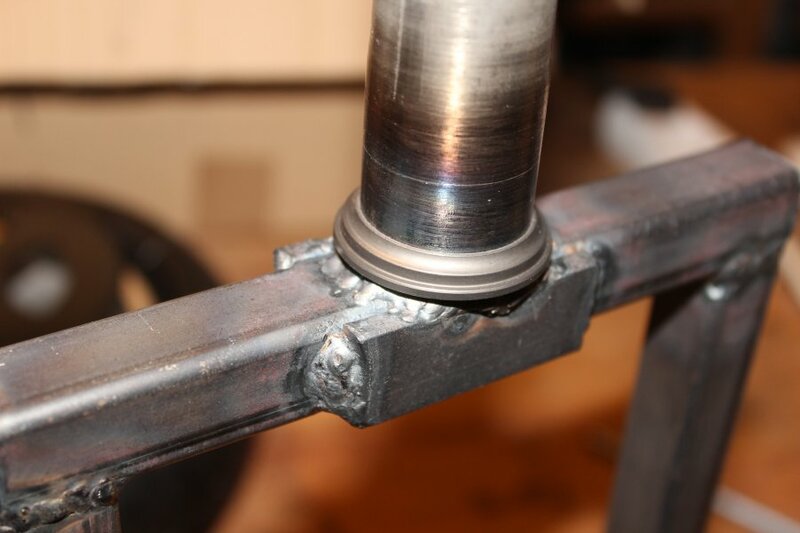 With the brake fixed in place I was able to weld the two steel pieces to the wheel fork. 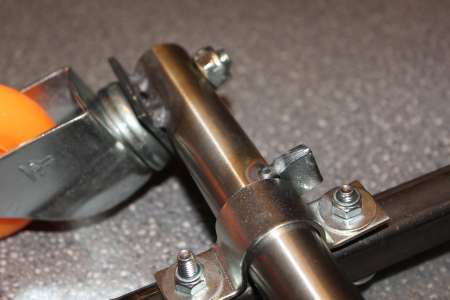 After cooling I loosened the brake again. 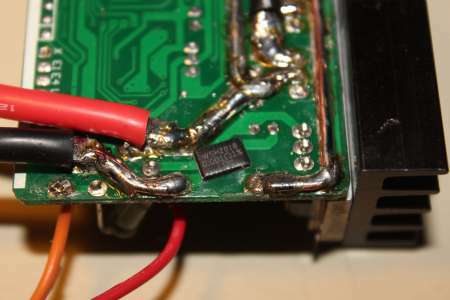 In order to connect the motor to the controller I equipped three 1m long 12AWG silicon wires with a 4mm bullet conntector each. To not strain the stiff cables coming out of the motor I put the silicon wires through the top of the wheel fork. 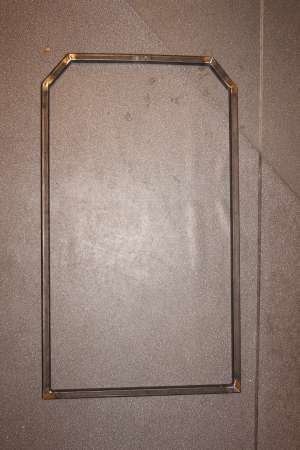 After that I left them hanging a bit and then attached them to the frame. 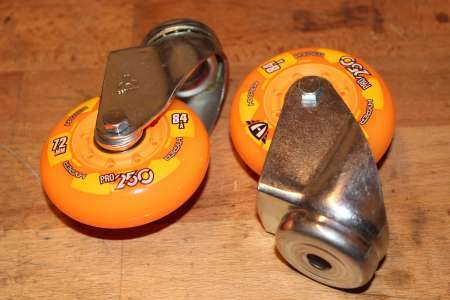 They are just as long as they need to be able to turn the front wheel 540° around (1.5 turns) so I am able to steer while driving backwards. 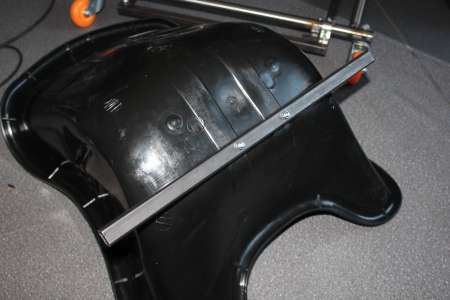 Between the seat and the front wheel I wanted some protective plate or splashguard, so that all the dirt doesn't get tossed right into my face. Also if the chain rips apart a protection between my private parts and the motor could be reasonable. Jumping over to the backside of the cart. 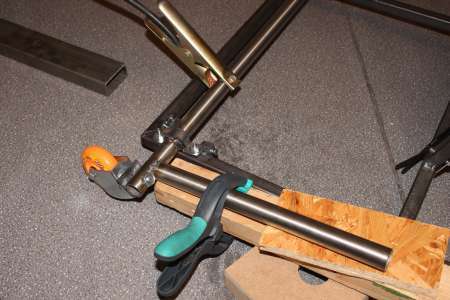 The back wheels with their assembly will get mounted on a 25mm stainless steel tube wich is simply held on the frame by two clamps. 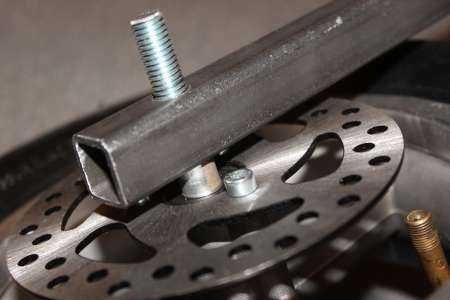 For the upper part of the backwheel assembly to be mounted firmly, it needed to sit flat on a small piece of steel (40x40mm) and fixed by a M10 screw. The steel piece is welded on both sides of the axle. To prevent the axle from moving sideways, a small piece is welded on the outer sides. Furthermore, the Axle should only be tilted by 45°, from straight to slightly angled backwards. For that, a small 45° angled steel section is mounted at the bottom of the axle. By adjusting the screw one is able to set the endpoint at wich the wheels are straight. 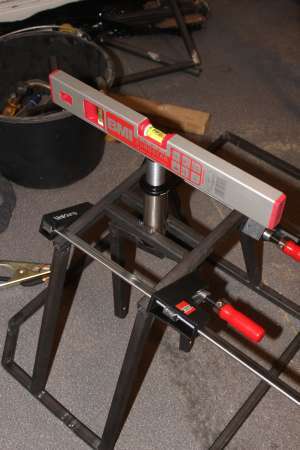 On the other side a roughly mounted steel piece limits the back angle. 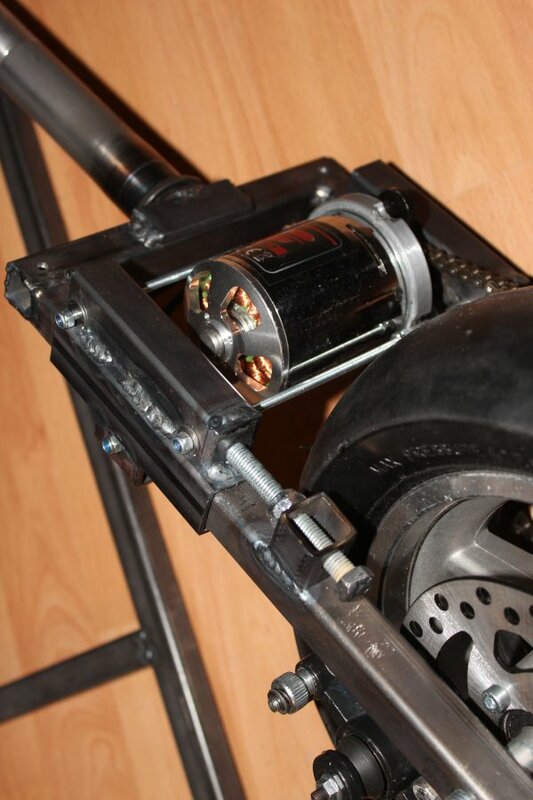 Later I added the same on the left side of the axle. Now its only the lever missing for the crazymode. 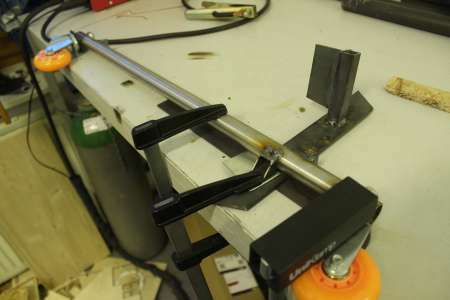 For that I took the rest of the stainless steel tube that was left from the axle and rounded one side of it to fit to the axle and welded it to it. 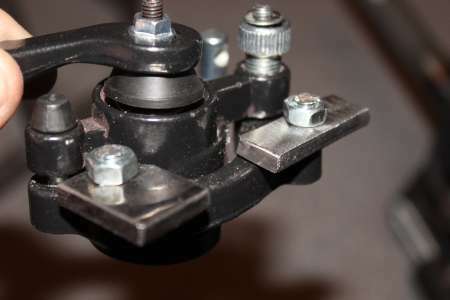 If the weels are tilted backwards the lever is only liftet by a few degrees, so that the hands are not too close to the ground. 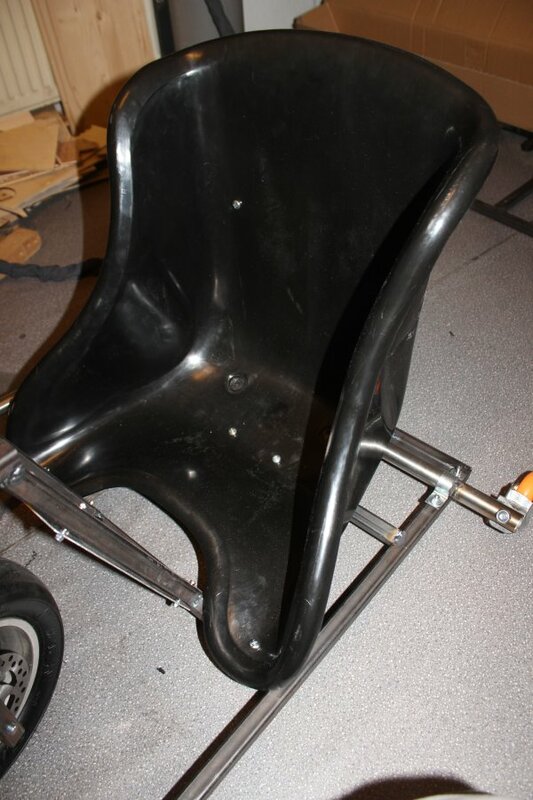 The seat is a XXL Cartseat. Well XXL, ... 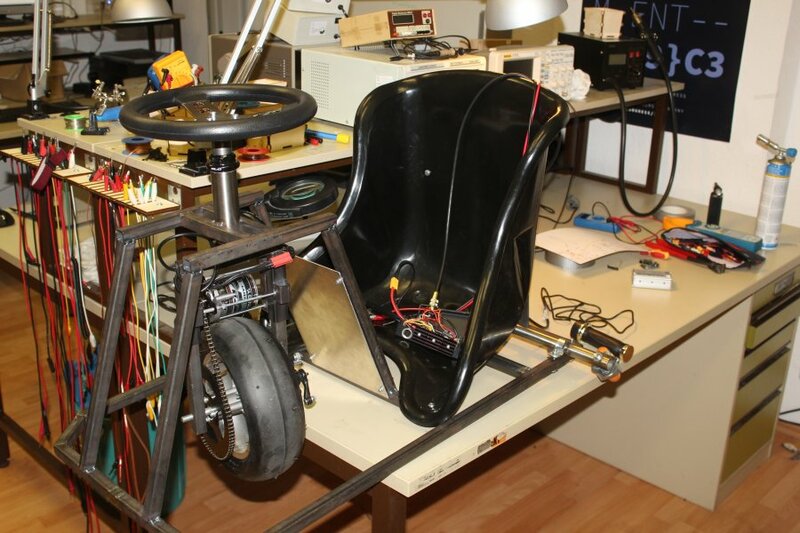 I'm really not fat, but sitting in there is really tight. 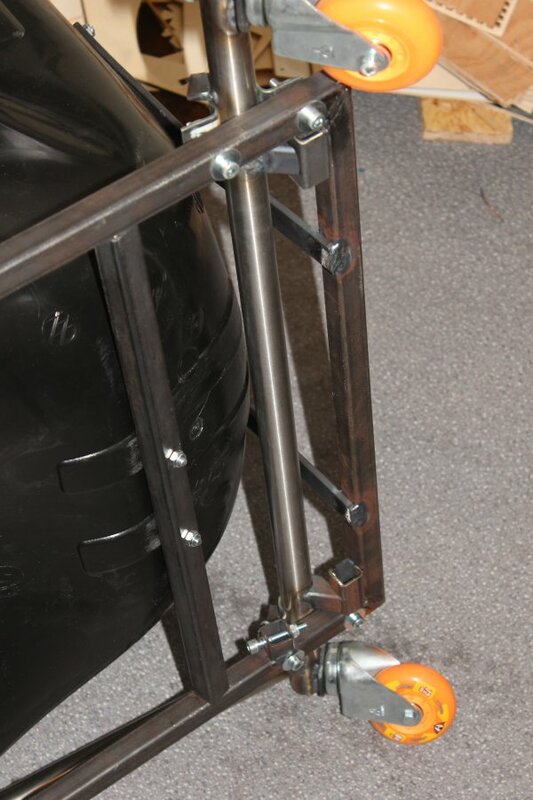 The most pressure will most likely be applied straight down, so I mounted a 20x20 steel section with M6 screws to the bottom of the seat. Next I drilled two holes trough both seat and frame at the front and screwed them together. With the seat held in place by those screws I was able to weld the steel section at a slight angle between the frame. 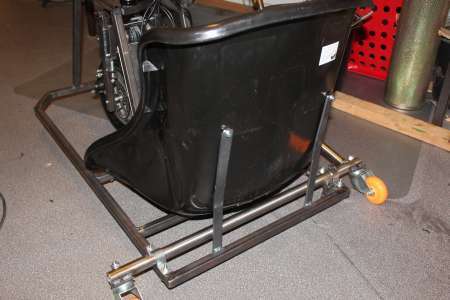 Behind the seat two 20x5mm steel bars fix it in position. Sitting on this thing can be described as riding a far too small bike, because both legs have to be bend quite a lot. 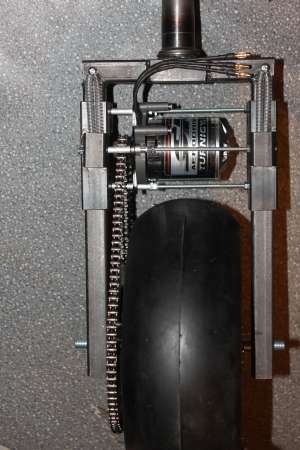 Apart from the brushless controller the cart is now ready to start. The brake isn't finished yet, but ... well. The BLDC motor controller is a so called mini jasontroller. 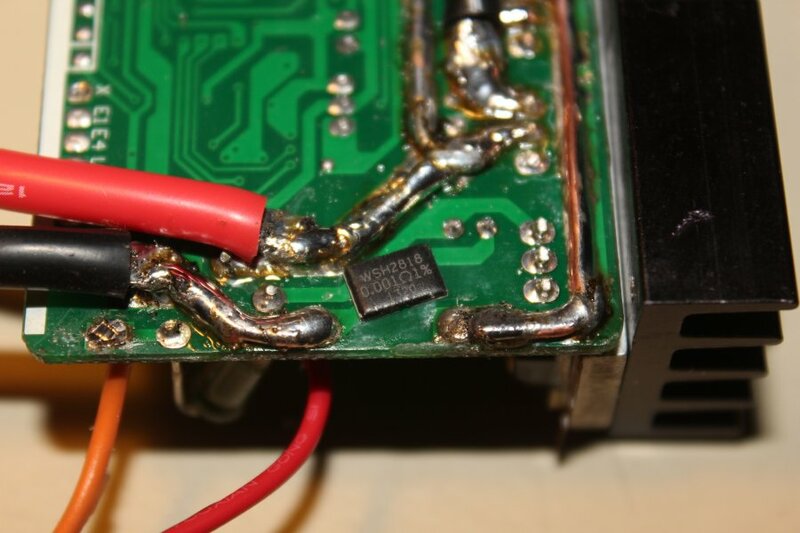 In advance: While testing I managed to kill the controller somehow, one of the mosfets and the corresponding gate driver are now defective. 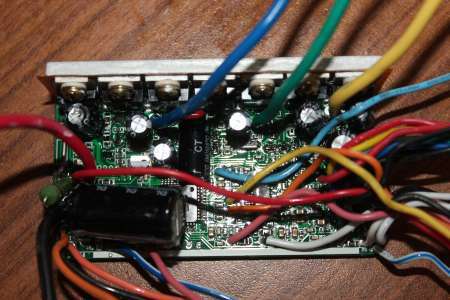 Because of the cheapness of this controller it seemed not worth the time to repair it, so I baught a new bigger one. 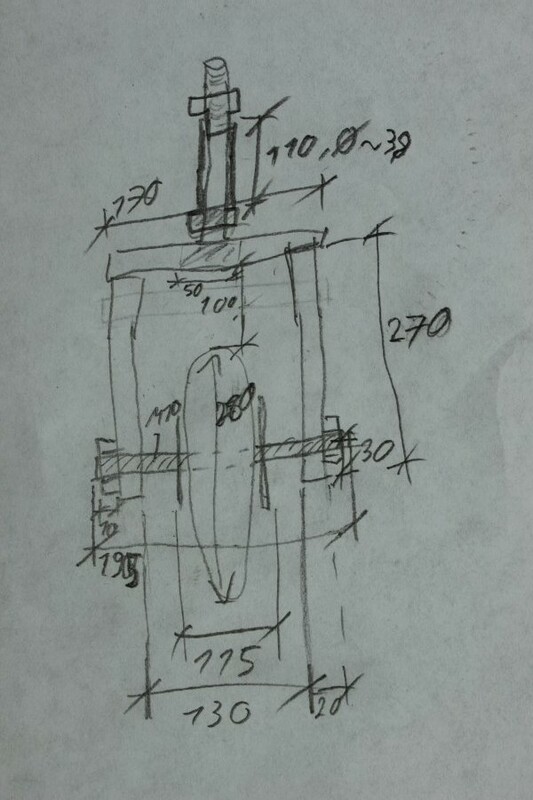 For the sake of completeness, I'm going to describe my modification anyway. 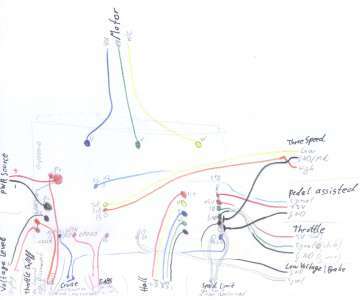 Those who aren't interested can jump to Part 2. 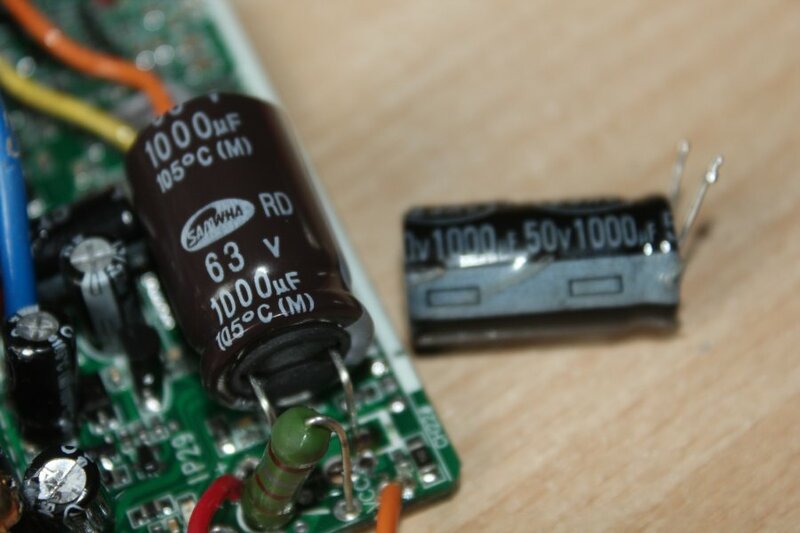 First I exchanged the 50V 100uF capacitor on the input side by an 63V equivalent. 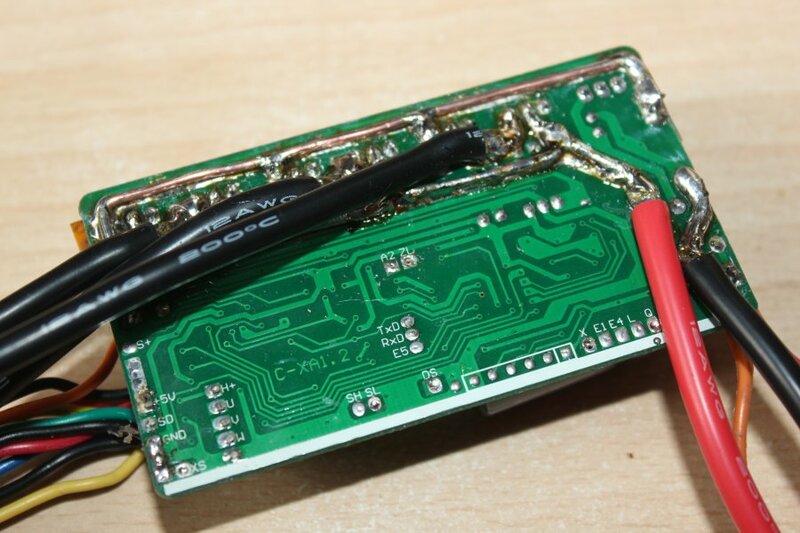 Many of the wires that come out of the controller I'm not going to need and therefore I desoldered them. 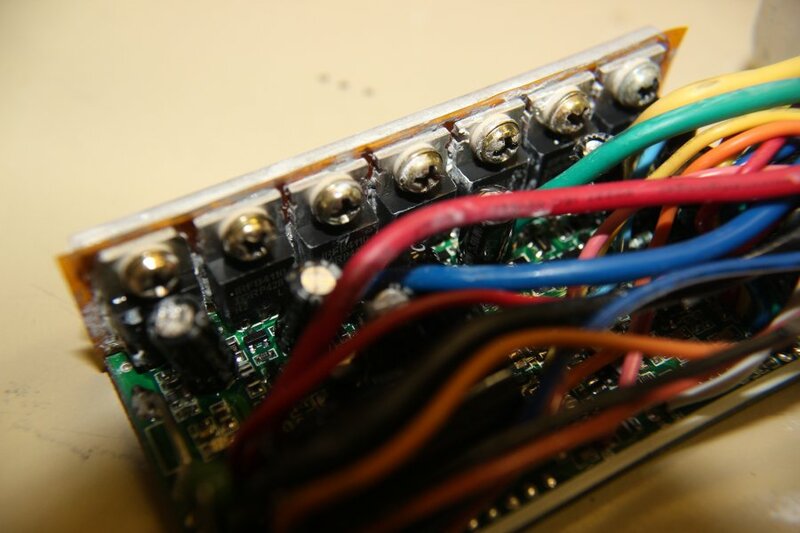 The labeling of those connectors I extrapolated from the wiring diagrams linked above and traced them to their corresponding soldering pads. 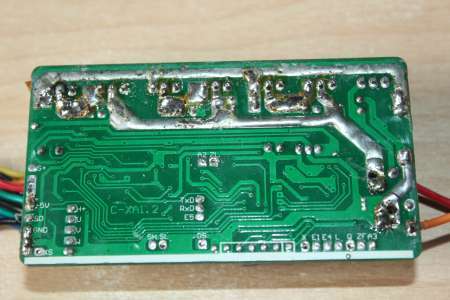 Voltage Level, Cruise, EABS, Speed Limit and Pedal assisted are the ones that can be desoldered completely and left unconnected. 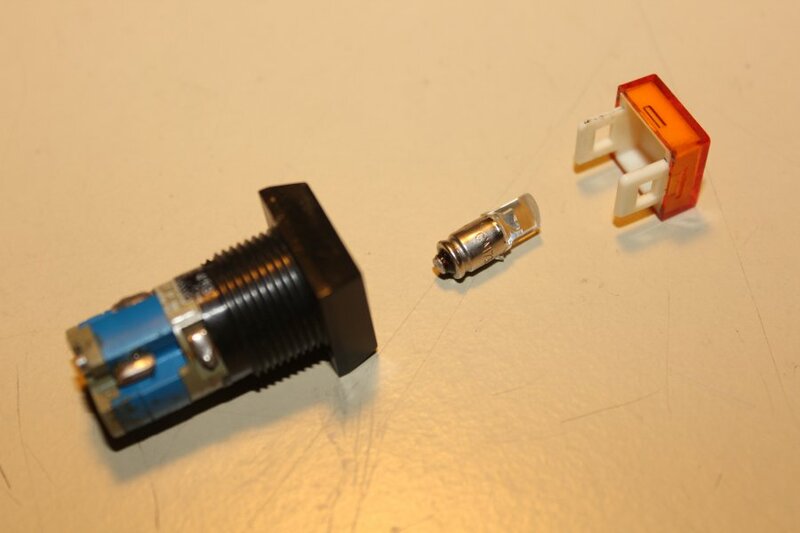 Three Speed can be soldered to an 3-way switch or just soldered together (Low: connect GND and Low, Mid: nothing connected, High: connect GND and High). 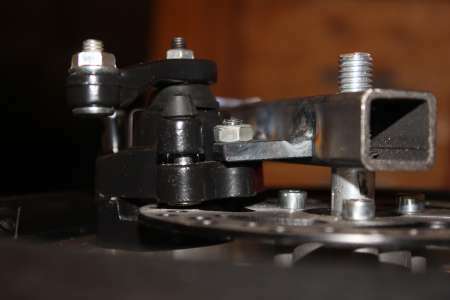 Later, brake can be connected to the brake pedal/lever, so that the motor does not turn while the brake is pulled. 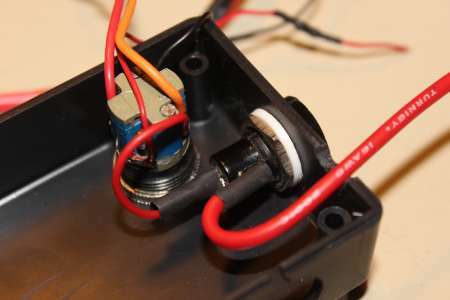 I connected throttle on/off to a switch, so by pressing that switch the controller gets activated. Because the controller was not build to handle 2.5kW the pcb traces are very thin. So I increased the current handling capability by adding some copper wires and solder to the traced coming from the power input to the mosfets. Also the heat has now to be dissipated much more. 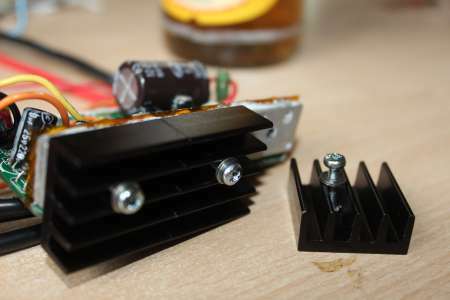 Therefore three heatsinks are mountet to the metal plate wich was originally mounted to the aluminium case. The switch to activate the controller is an old switch with a lightbulb in it. The lightbulb was already damaged and not designed for 5V operation so I took the glass out of the socket and inserted a red led in its place. 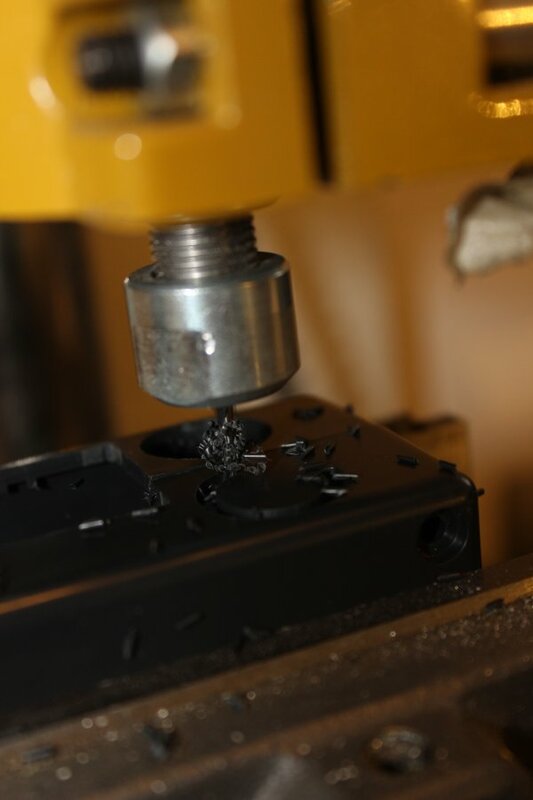 The aluminium case is now way too small, so I put the controller board with the switches and some jacks into a new plastic case. 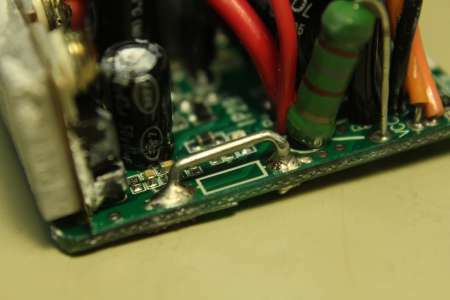 The 1mOhm smd resistor was soldered upside down right under the 6mOhm wire resistor. To have the possibility to install some lights I wanted to have the 50 Volts additionally coming out of the controller case. 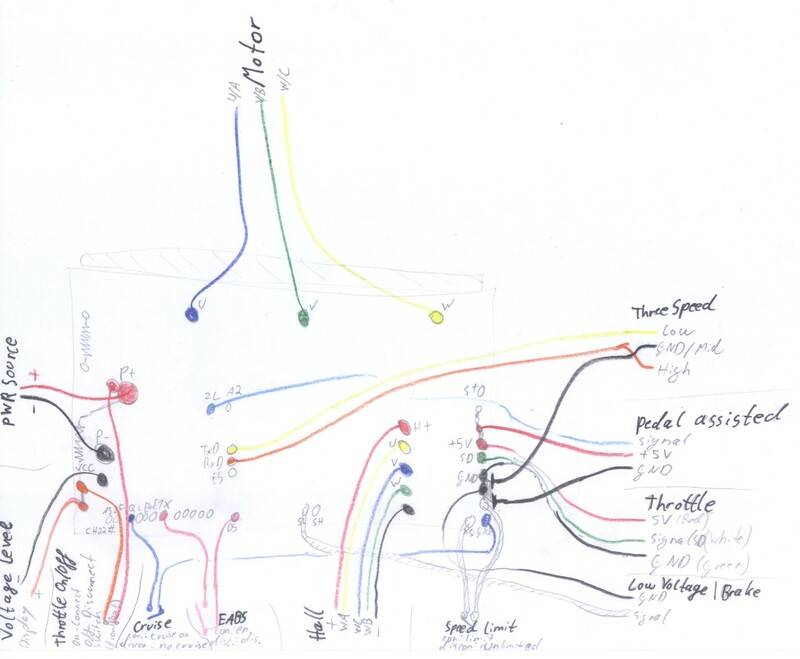 In case that the lights etc. 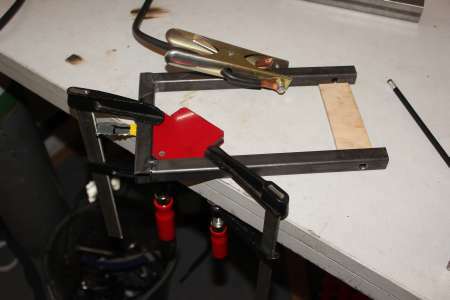 cause a short I added a small fuse holder with a 1A fuse in it to protect the rest of the cart, so that the wires don't have to burn as some kind of fuse. 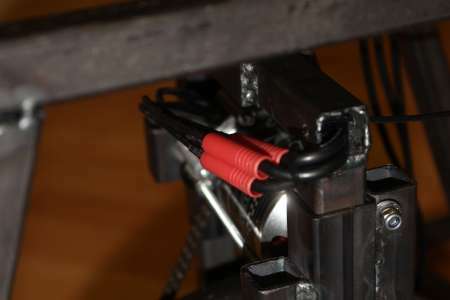 Two tuchel connectors are installed for the hall sensors (5 Poles) and the accelerator pedal with brake switch (4 Poles). Then the cart was placed on a table so that the front wheel is able to spin free. 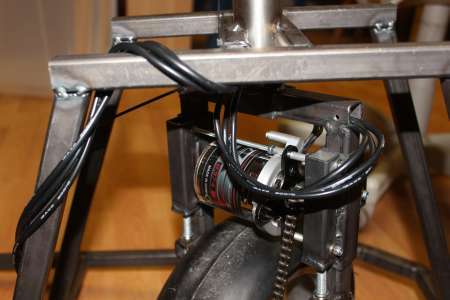 Without the hall sensors the motor runs as expected. By applying too much throttle the controller will cut out while freewheeling in consequence of the maximum commutation frequency of the controller. On start up the motor cogs, because it has to be "pushed" randomly by the controller so it can determine it's position (see Back-EMF (Wikipedia)). 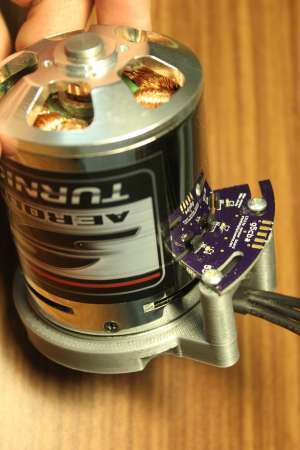 Then I connected the hallsensors, wich you can see on the small pcb next to the motor. One of the sensors has to be placed right into a slot of the stator windings. A good documentation on how to find the right combination can be found on e0designs.com/documentation/finding-motor-phase-sensor-combinations/. 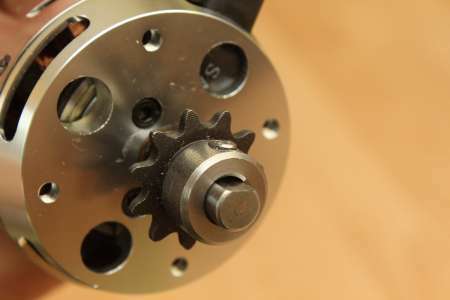 Apparently the first combination I've tried wasn't that bad, at least the motor did turn in the right direction, although still cogs as before. For comparitive testing I've switched two of the sensors, the motor didn't turn anymore. 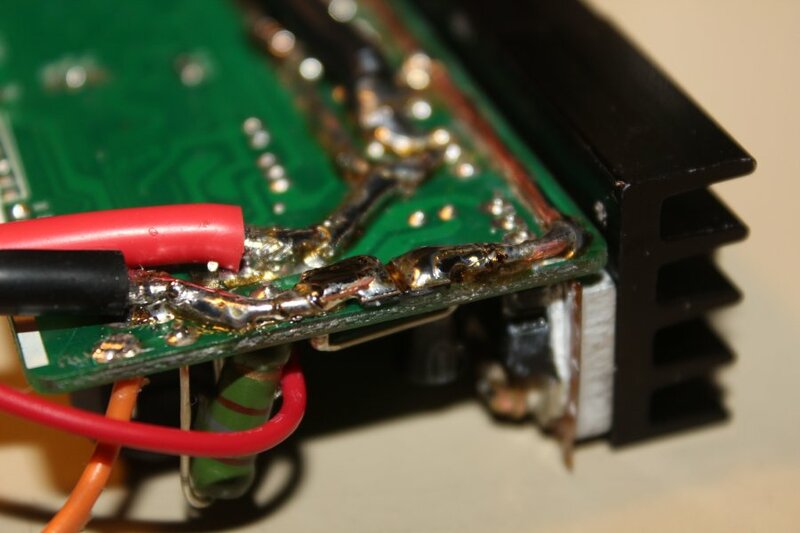 But, because the beefy lipos were still connected and I maybe pushed the throttle a little too far, one of the fets must have let the magic smoke out, along with it's gate driver. Well, as said before, I bought a new controller. 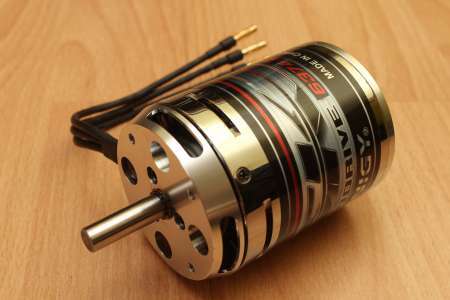 In the future I will test the motor on a lab power supply first everytime.